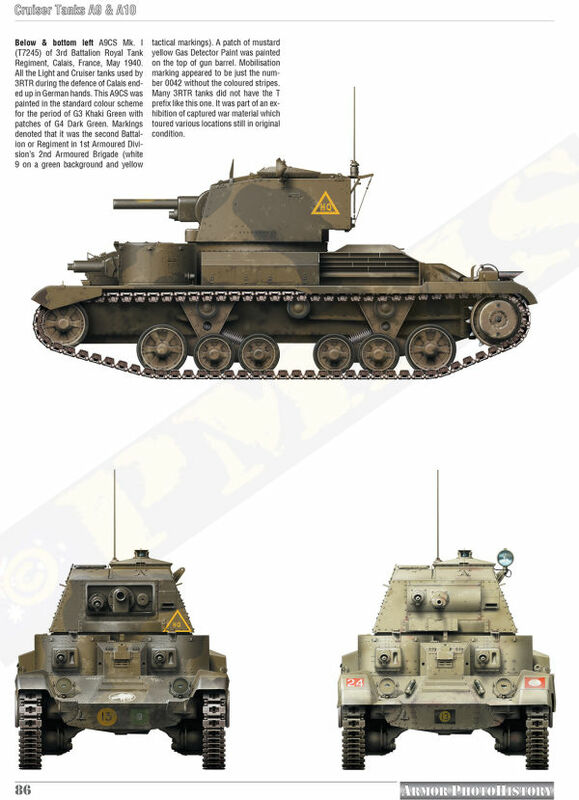 This new book from Model Centrum Progres is dedicated to the first of the British Cruiser Tanks, A9 & A10. 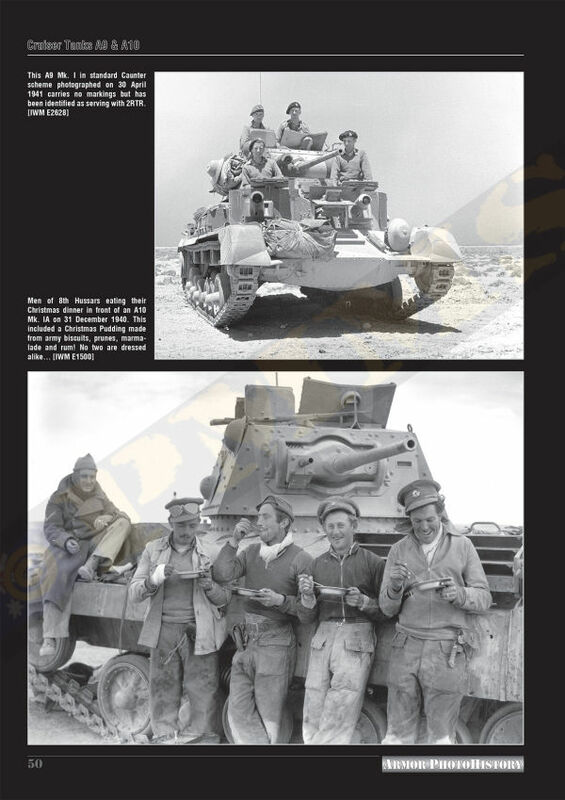 They played an important part in the battles in France in 1940, North Africa in 1941 and in Greece before being withdrawn from frontline service. 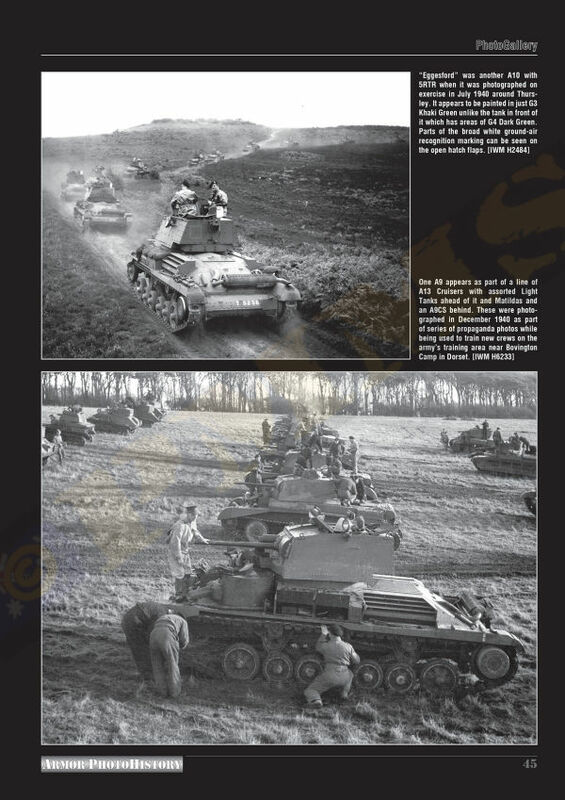 The book while in the PhotoHistory series has a lot more covering their development, production and service histories along with extensive period photo coverage from archives and private collections. 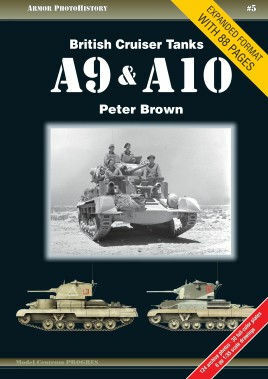 The author Peter Brown has researched British AFVs for 40 years and has contributed many articles to professional and modeling magazines. 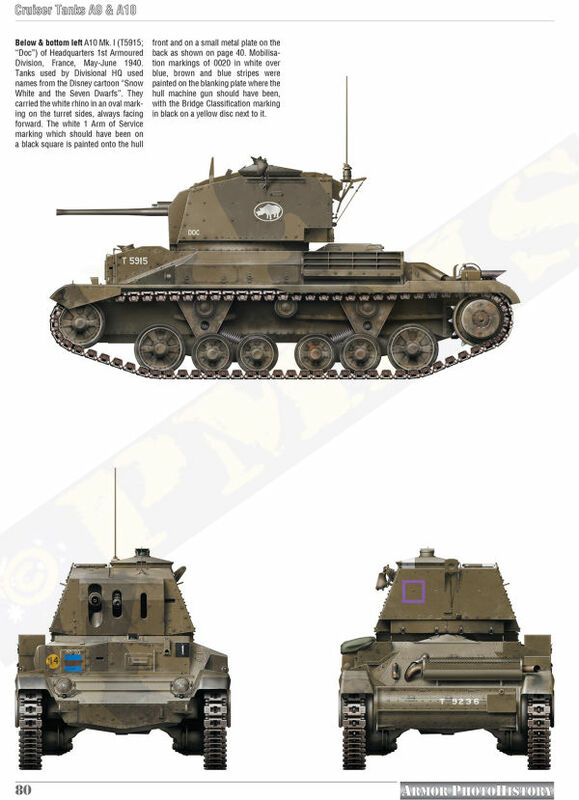 The first seven pages has a brief history of the development of the Cruiser Tank focussing on the A9/A10 obviously with tables giving the comparative specifications of the A9/A10 and the designations of the Cruiser/Infantry tanks from A9 through to A22. 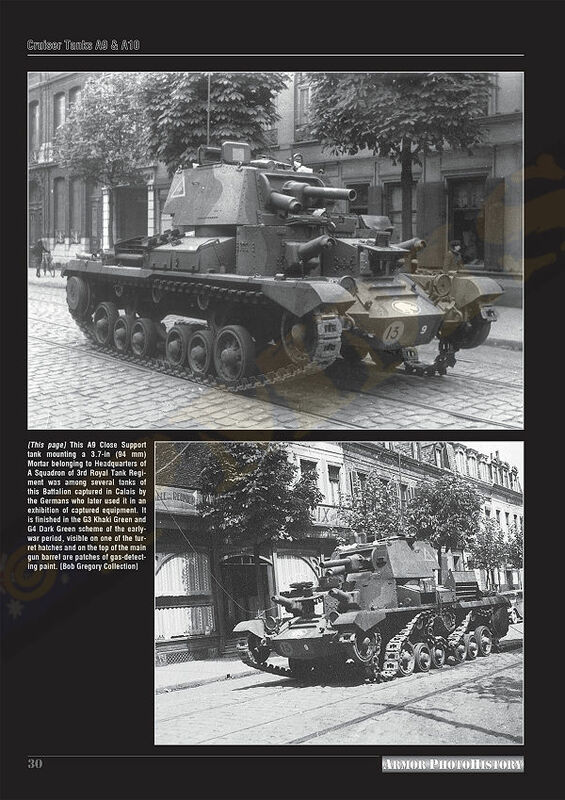 Intermixed with the text are period photos of the various prototype A9/A10 vehicles which show the variations between the initial prototypes to the first production vehicles. 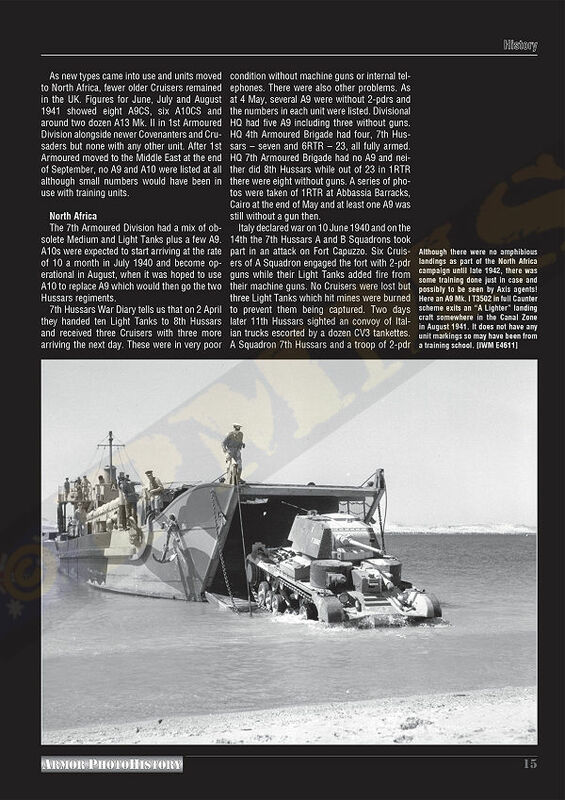 The next sixteen pages sub-titled "Into Service" is more text intensive with most pages having a single larger photo and remainder text giving a detailed coverage of the A9/A10 service histories in Egypt initially, then into battle in the France campaign, the extensive use in North Africa and in Greece during 1941 through to its swansong as a combat tank in 1942. 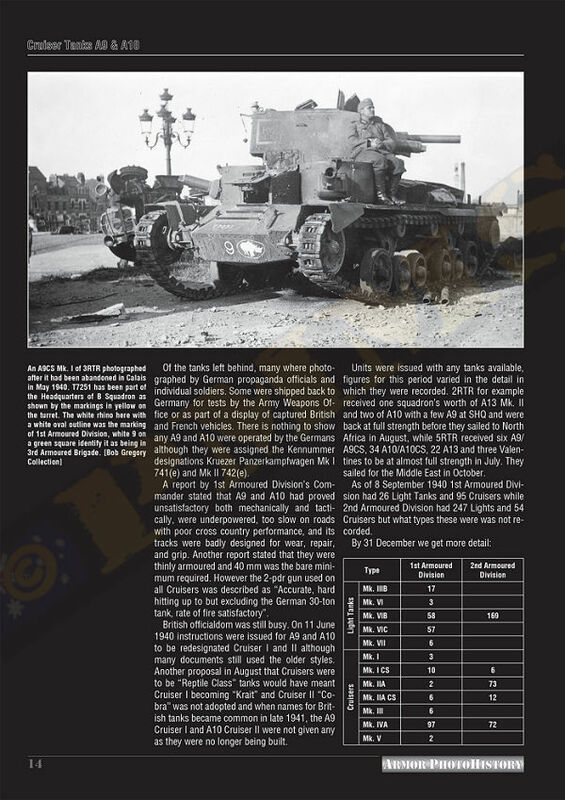 Intermixed with the text are various tables showing the various Units and the tanks on hand for given campaigns with this chapter having a wealth of detailed information to give good backgrounds for most modellers. This chapter as the name PhotoGallery suggests is entirely made up of B&W period photos with the only text being the photo captions, the photos are either 2,3 or 4 to a page and are all semi-close-up field type photos that while not having close-up (walk-around type) details they show more than enough detail of the various Mk's to get a good understanding of the differences between the types. 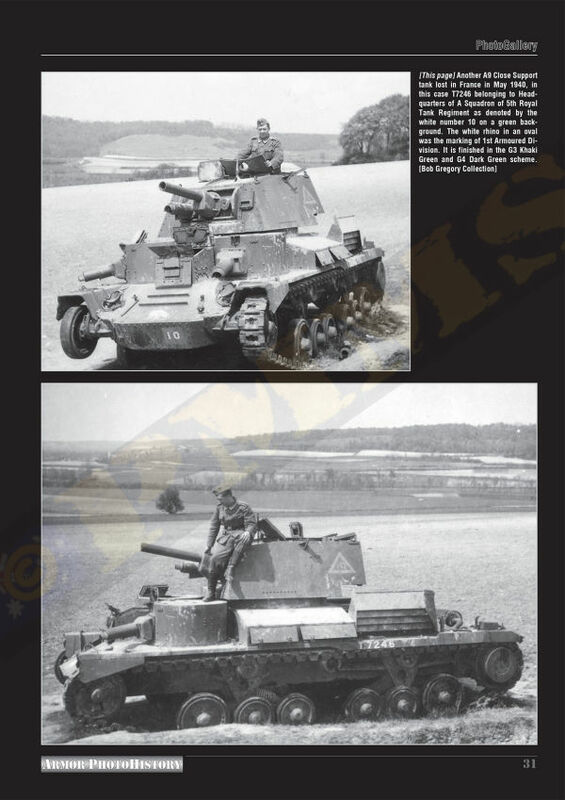 One thing of interest is that the use of the auxiliary fuel tank on the front left fender was quite rare with just two photos in this whole section showing it fitted, this should be interest with the forthcoming kits. 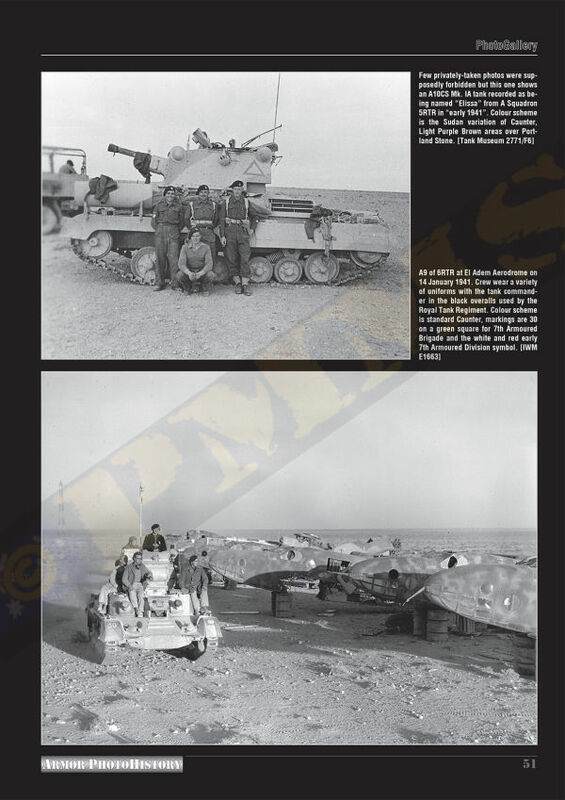 The photos covering both the A9/A10 has shots from all the campaigns the vehicles fought in to provide good reference on fittings and such for those wanting to build a model in the different settings, quite a few shots are also of damaged and disabled vehicles which is a common theme with period photos as well as plenty of service vehicles and their crews. 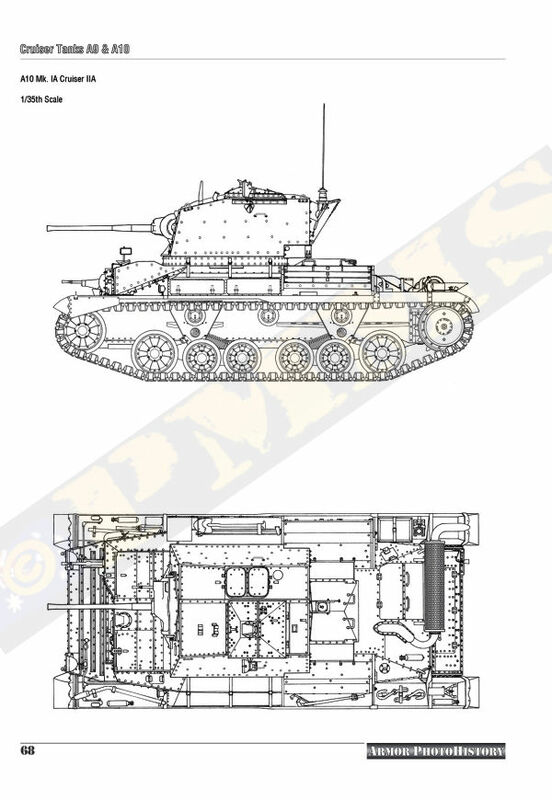 This chapter has six pages of 1:35 plans with left side plan views of the A9CS and A9 Mk.I with desert fittings, five view plans of the A9 Mk.I and A10 Mk.IA plus addition left side plan views of the A10CS and A10 Mk.IA with desert fittings for a good overall coverage of the different types. 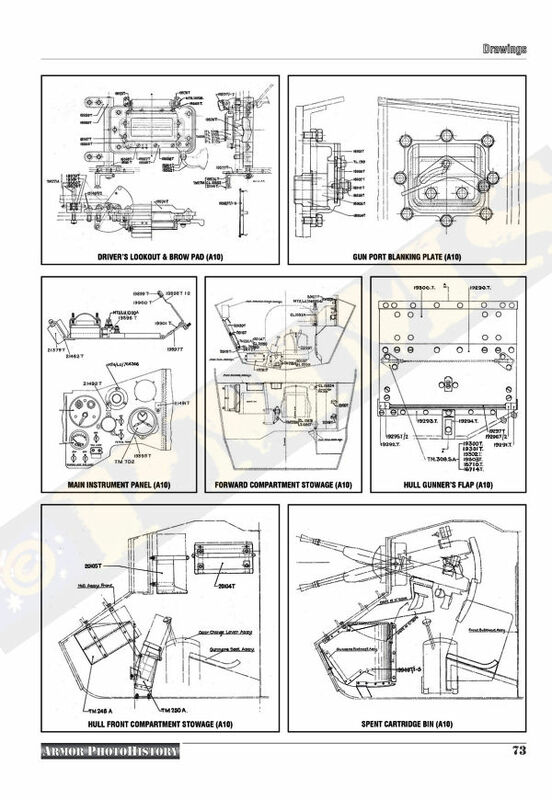 The final eight pages has a series of technical drawings of individual components such as crew seats, gear change and steering controls, the A9 auxiliary turrets and gunner's seats, instrument panels, hull compartment storage layouts, suspension cross sections, various hatches and various hull plates. 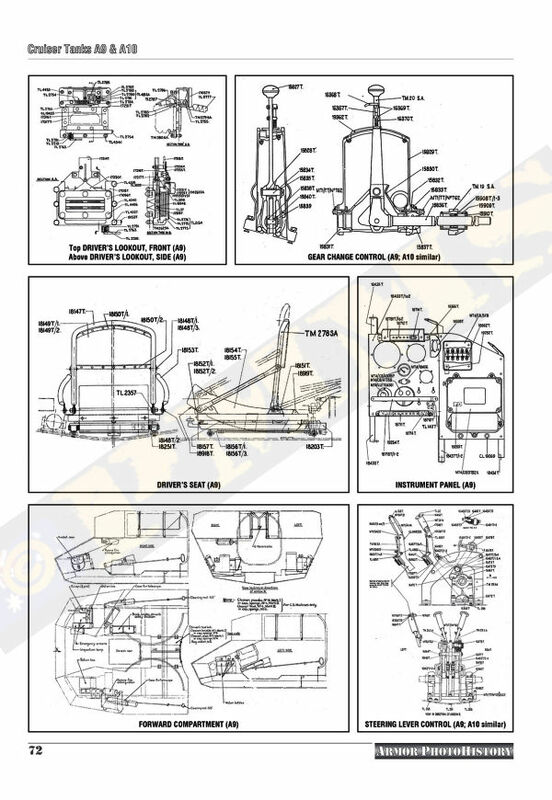 This section is for those who really want to get into the technical side of the vehicle construction but will also be useful for adding interior or other details to your model. 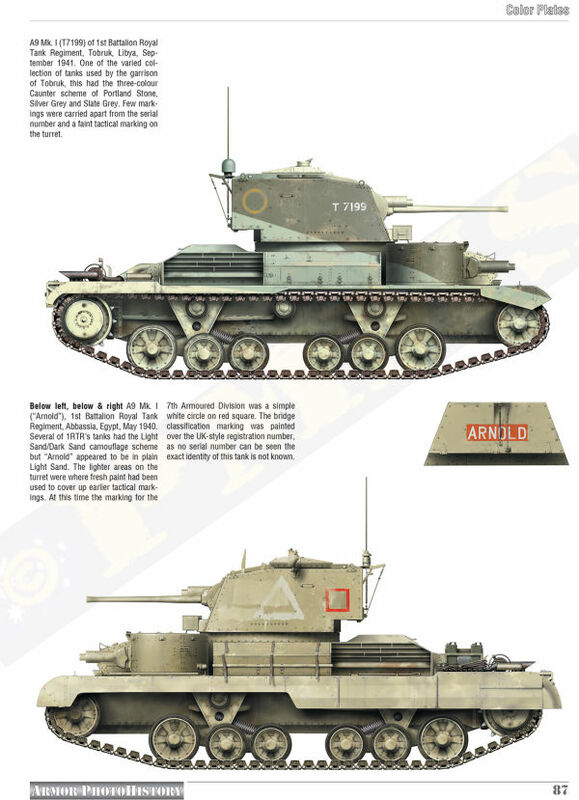 This final ten-page chapter has colour plates of A9/A10s from the various campaigns with some being three view illustrations showing the cam schemes and tactical markings with others having a single side view illustration. 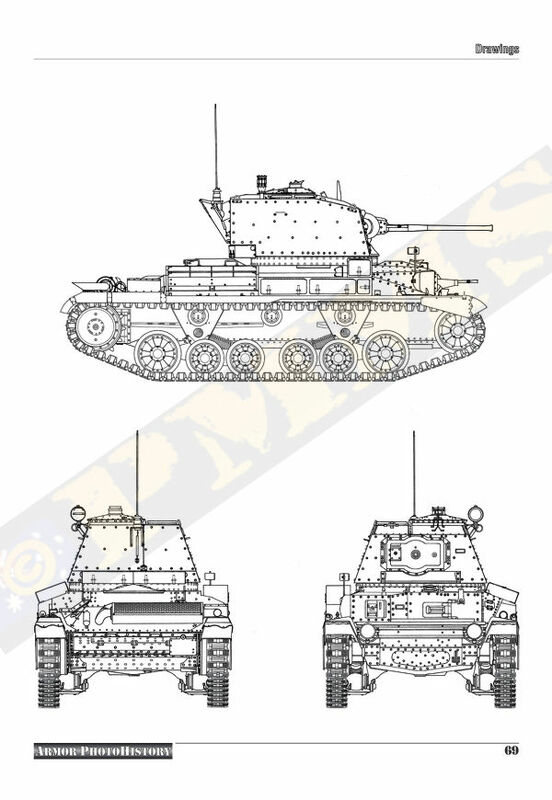 All the colour plate illustrations are also in 1:35 scale to help if you wish to create the markings for a particular model. 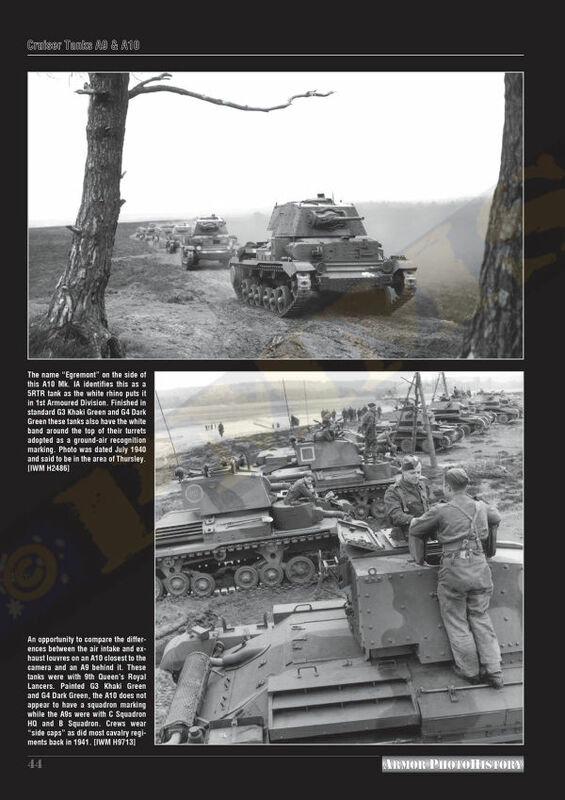 This timely release from Model Centrum Progres provides extensive historical and development history as well as extensive photo coverage of the A9/A10 from prototype through to the different in-service Mks, while there are no walk-around type detailed photos those included still provide plenty of overall details to highlight the different features of each Mk. 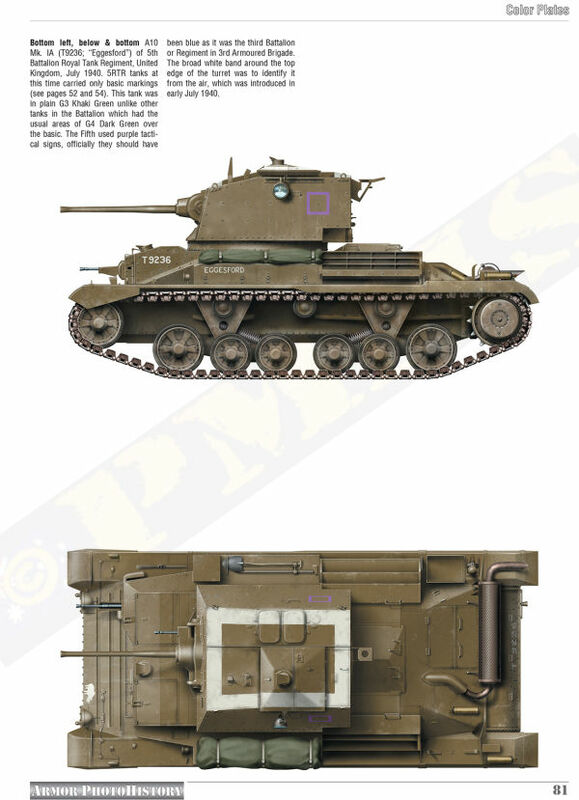 with the turret roof and engine deck also being shown making the book an indispensable reference for anyone interested in these early war British Cruiser tanks and even more so if you plan on getting either or both of the Bronco/Gecko kits.